If life is meant to be joyful, why are we faced with a global pandemic of depression? The combination of seven intense years as a crisis counselor in New York plus twenty years as an Awakening Life Coach allows me to offer you this insight – the truth about depression – and when you finally understand why you are depressed, you will have the power to free yourself from the invisible prison of disempowerment. Firstly, do not let the “real” in reality fool you. Things are not what they seem to be. Despite how solid life appears, it is all just vibrating energy so perfectly choreographed that we can confidently call this dancing vibration “reality” or life. If you want to see the truth from a higher (more realistic) perspective, you will need to consider that it is our individual and collective Beliefs that turn vibration into tangible reality. It is common knowledge that our beliefs directly manifest through our actions and reactions, but beliefs also communicate energetically with the quantum field and then materialize in physical reality. As the saying goes, “thoughts become things.” A single thought is not likely to manifest, but beliefs always do. It might be more accurate to say, “Beliefs become all things.” This means that everything in your life is a result of your beliefs – your beliefs create your reality. Unworthiness: you believe that your worth is dependent on proving that you are worthy. Powerlessness: you believe that you have little or no power to control your life. Victimhood: you believe that others can harm you in some way. These three disempowering beliefs make up the invisible Matrix of Depression. Once these beliefs are installed in our psyches, we unconsciously look for proof of their validity. Since life offers whatever we seek, we end up with an abundance of proof by means of experiences that make us feel unworthy, powerless or victimized. When one or more of these beliefs continue without relief, we become depressed. As we have been drugged with delusion, we have been programmed to be depressed. When left unchallenged, deeply embedded beliefs become subconscious programs that run our lives, and unconsciously control behavior. These programs manifest as chronic negative thoughts and emotions and also as challenging experiences, such as failed relationships, financial hardship, illness etc…. Needless to say, beliefs of powerlessness, unworthiness and victimhood are all programs that operate our global society. Even if you are not depressed, these programs cause extreme disruption to the body, mind and spirit, and materialize as virtually every issue known to mankind. I have professionally coached people worldwide for the last 20 years, and every person I have ever worked with has suffered from one or more of these disempowering beliefs, and most of these same people would not even define themselves as depressed. Virtually every problem in life is due to the fact that society is asleep under a heavy cloak of disempowerment. These 3 disempowering programs are so prevalent in every aspect of our lives that we don’t even notice them, but once you learn to recognize them, everything becomes perfectly clear. Educational Institution: installs the unworthiness program. From day one of school, we must pass tests and be evaluated for worth every step of the way. Criminal System: installs the victimhood program. The criminal system is set up, not to deter criminals, but rather to create them, perpetuating victimhood. Medical Institution: installs the powerlessness and victimhood programs, through the use of patient disempowerment. Religion: installs the powerlessness and unworthiness programs. Most religions teach people that something “out there” has the power to choose their faith – with rewards for goodness and punishments for subjective sin. Government: installs the powerlessness program, where the people depend on their “leaders” for laws and protection. War: installs programs of victimhood, powerless and unworthiness. Financial Institution: installs programs of unworthiness, powerlessness and victimhood. Every one of these systems and institutions are designed to make us believe that we are powerless and at any moment we could be victimized. They program us to believe that our worth is dependent upon external sources and that we have to keep jumping through hoops in order to prove that we are worthy. Even when we feel worthy and powerful, there is always the fear that it can all be taken away – that at any moment we can lose everything – through economic collapse, sickness or war. There is no mystery as to how, or why, humanity is enslaved – every aspect of society is set up to mentally imprison us by means of hi-jacking our belief system. We are in economic and environmental crisis because humanity is in a massive spiritual crisis. Who is really running the nuts and bolts of these systems? We are! We are the doctors, lawyers, teachers, clergy and sometimes even local politicians. We need to wake-up and stop following antiquated rules and programs that are intended to brainwash us to play unconscious roles in controlling those who look up to us and trust us. The broken system runs because we sustain it. Unsustainable systems eventually collapse. As long as we seek external solutions to our problems and blame those who seem to be in control, we will never realize that it isour beliefs that project, create and attract the reality that we experience. The external chaos is a manifestation of your beliefs, and keeps you from finding the real cause of issues which lies within you, in the form of your own beliefs. You have the absolute power to consciously create your life and no one can ever control you or manipulate your reality, unless you allow them. We are led to believe that we are powerless minions under the rule of some elitist super-power. However, that is just part of the illusion. Even those representing this super power suffer from the same debilitating programs that we do – you cannot enslave another without enslaving yourself. From this grand view, there are no bad guys – everyone is just playing their roles in the game. Instead of blaming anyone and reinforcing the victimhood program, let’s wake-up and embrace a new paradigm that empowers all of humanity. As we free ourselves, we free those enslaving us. Despite how it might seem, no one is imprisoning us or keeping us hostage. We have been imprisoning ourselves through the massive power of our own belief. We have been locked in a jail without walls or borders. It is invisible yet it is everywhere. It is an energy that surrounds us and invades our lives. We let it in willingly through the choices we make and the things we watch and listen to. We can’t see it, smell it or taste it because we cannot identify it. But once you know that it is there and what it is, you cannot ignore it, and this is the beginning of True Freedom. It is easy to give away your power when you are asleep but impossible for anyone to take your power when you are awake. You don’t have to overcome depression – you just have to wake up. The opposite of depressed is awakened. This truth shall set you free. Escaping the Matrix of Depression requires us to take our power back from unscrupulous sources. This doesn’t mean rioting nor does it mean fighting against these systems. If your instinct is to accuse or lash out, you are going in the wrong direction which only gives power and energy to that which we are wanting to change. This is not a war – this is an awakening. We are talking about taking our power back through a total rebellion of the mind. In order to emancipate ourselves from mental slavery we must reclaim our beliefs. We must turn off those obnoxious disempowering programs that have been running us and our ancestors for countless centuries — maybe even longer. It is the power of your belief that “makes” something true and materializes it in the world. When you release these false and disempowering beliefs, the dysfunctions caused by the beliefs go away. A healthy functioning human-being knows his/her innate worth, intrinsic power, and ability to consciously create, and therefore does not unconsciously manifest ongoing issues or chronic depression. You are meant to live a joyous, healthy and abundant life. This is what you are awakening to! The first step is to turn off the disempowering programs that are running you. You know that these programs are running if you experience frequent or strong feelings of powerlessness, unworthiness and/or victimhood, as well as chronic issues in relationships, health and/or finances. Over the past few decades, many of us have worked through a great deal of victimhood issues, but the opposite of victim is not “survivor.” The opposite of victim is Conscious Creator. You are responsible for everything that happens in your life. No matter how it seems, you are never a victim. Every experience in your life is a perfect vibrational match. As long as you blame the outside world or the carelessness of others, you will stay disempowered and you will keep the victimhood program running. I’m not saying that you should cancel your insurance. I am saying, stop blaming others, and start taking responsibility for everything in your life – not from a space of shame or self-blame but rather from a space of pure empowerment. The more responsibility you take for your life, the more you will access your power to consciously create. In order to turn off the unworthiness program, you must get off the unworthiness wheel of mis-fortune, and you must simply own your worth and declare it for yourself, without needing proof that you are worthy. Trying to prove your worth keeps the program running. It is important that you meet your own emotional needs and stop seeking approval and acceptance from people who don’t have it to give. As long as you need the acceptance and approval of others, you will never know your intrinsic worth. Give to yourself what you seek from others, and you will begin to remember the truth of who you really are. You turn off the powerlessness program by taking your power back from everyone and everything. Stop depending on the legal system for justice, the police for protection, the medical system for healing, and schools for education. Become your own sovereign agent, and if you do use “the system,” do so consciously and make your own choices. Research new paradigms for healing, justice, community and education or invoke your imagination for creating new possibilities. Think for yourself and stop depending on the support and opinions of others. If you are not consciously creating your reality, you have given up control. I personally suffered from chronic depression since I was a child. As I look back, it is so clear to me now, that I found my way up and out of depression, by working through issues of victimhood, unworthiness and powerlessness. I spent many years overcoming these debilitating beliefs – finally finding myself to be a conscious and joyful creator of my reality. I am sharing this now so that you can recognize the core dynamics of depression, and as a result, the process of your healing is quickened exponentially. The one thing that all these global systems and institutions have in common is that they keep us from trusting ourselves. Everywhere you look, the message is the same, “Don’t trust yourself.” You must trust authority figures to diagnosis, approve, reward and heal, as well as provide justice, safety, nutrition, and even water. Here’s the thing, it has become painfully clear that we cannot rely on those whom we have carelessly trusted. Judges who “read the law out of the law,” doctors who get paid off by prescription companies, and governments who poison our food and water. Do not despair – this is the greatest news ever! In the past, when the truth wasn’t so blatant, we could be complacent – we could stay asleep and give our power away without thinking much about it, but now, we know too much to close our eyes and bury our heads in the sand. There is no doubt that those institutions that we once trusted with our lives and the lives of our children can no longer be blindly trusted. Life, and everything in it, is begging us to reclaim our power from untrust-worthy sources and to empower ourselves with solutions that will transform and evolve humanity. I know that it is easier said than done, as the disempowering programs are intrinsically designed to keep you from trusting yourself – forcing you to look to external sources for the answers to the problems that they created, and when you are tired and depressed, trusting yourself is the hardest thing to do, but you must do it anyway. You must find the part of you that knows how to access answers and solutions for yourself, and you must follow that inner guidance wherever it takes you. The purpose of life is to demonstrate your beliefs to you. If you like the feedback that life is giving you, keep believing as you do. If you don’t like the feedback, change the beliefs that are responsible for the undesirable feedback. Let’s be clear, the feedback is what life shows you through experiences and relationships – not what is told to you by others. Right now your world may be giving you immense proof that you are unworthy, poor or powerless but that is only because life is demonstrating your past and current beliefs. It is normal to want proof before you can believe something different, but this misconception keeps you imprisoned in disempowering beliefs and the resulting experiences. Do not ask, “Is this belief true?” as no belief is true until you make it true through the power of your belief. If the answer is no, scrap it. If the answer is yes, ride that train home! In order to wake up from depression you must believe that you are unconditionally worthy and that you have the power to consciously create your life. You have the ability to create a new reality with your thoughts but in order to do so, you must have thoughts that can create a new reality. Your work is to create empowering thoughts and as you create better and better thoughts, you will create new empowering beliefs, ultimately reprogramming your subconscious mind – and manifesting in an enlightened reality. This is the way of the spiritual warrior – we are here to break free of the invisible chains that have bound humanity. We are here to free ourselves and each other. One thought at a time. Whenever you say, “I AM” you invoke a belief. If you say, I am sick or poor, you are telling the quantum field to manifest sickness or poverty. Clean up your “I AM” statements and consciously develop “I AM” statements that support you, such as, I Am worthy, I Am abundant, I Am healthy. Self-judgment reinforces the programs of unworthiness and powerlessness. Don’t hide behind perfectionism either – it is just another sneaky name for self-judgment. Empowering self-talk will get you much closer to excellence than perfection ever could. Your body is an incredible quantum computer that must be cared for and fine-tuned. You cannot wake-up from depression if your body is depleted. Now is the time to “get in your body” and feed your body what it needs most. “Mother Earth” remembers who you are, and if you allow her, she will wake you up. One of the best things that you can do is play in nature – swim in her oceans, climb her mountains or frolic with her furry friends. As you surrender to “play,” your inner being will begin to awaken. Emotions are manifestations of beliefs, but you don’t need to know the cause of an emotion in order to release it. Just make sure that you allow an emotion to “process-through” to completion and you are not activating it only to push it back down. In other words, feel your feelings and allow time and space to really experience them. Since all disempowering beliefs keep us from loving ourselves, it essential to express self-compassion. Self-love is an activation and will help you to remember who you really are. If self-love isn’t flowing, focus on anyone/anything that invokes your love. The more you express yourself, the more you will activate the free will of self-expression which helps to turn off these programs. Sing, dance, write, innovate and speak your truth! When we are depressed, we automatically imagine all that we do not desire, but to overcome depression and turn off these debilitating programs, it is essential that you spend time every day imagining the life you really desire. The more you can imagine positive things in your life, without doubt or thoughts of unworthiness, the greater the shifts to your psyche and to your life. There is nothing outside of you stronger or more powerful than what lies within. Your moment of true empowerment is now. You have immense power to create the life you desire, but in order to access this power, you must first know that it is within you, and you must also master the mental technology of your mind that is responsible for creating your life. This means ridding your-self of disempowering beliefs and embracing the truth of who you really are. As you intentionally and consciously invoke the Law of Belief, you have the ability to free yourself from the invisible matrix of depression, and finally create the life you truly desire. You are love, you are light, and all is well. This article is an excerpt from the book Escape the Matrix of Depression by Nanice Ellis. Read the book "Escape The Matrix of Depression"
We are not meant to be depressed, yet millions of people worldwide suffer, from mild to chronic, depression, and don’t know why. New from author Nanice Ellis, Escape the Matrix of Depression will help you to understand the core reasons why a pandemic of depression darkens the world, and how you can free yourself. Nanice overcame many years of depression in her own life and, as a Life Coach for over 20 years, has helped countless people worldwide awaken from depression and reclaim their lives. Is humanity programmed to be depressed through education, religion, culture and more? Did the Great Depression cause our ancestors to be depressed, and have we inherited depression in our DNA? Could depression be a survival mechanism for habitual Negative Thinking? Is depression the result of suppressing our real selves? You will learn how to overcome depression by learning how to turn off the four Disempowering Programs that cause depression. Self-Expression as a key for healing. How Beliefs set the stage for depression. Trusting Yourself and how to do it. Depression and the Vibrational Parasite. Also, included, is a chapter on Teen Depression, and how to help your teen. 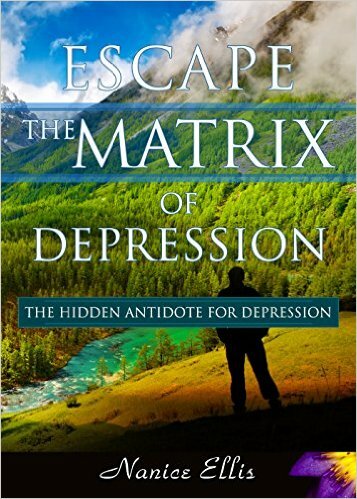 ‘Escape The Matrix of Depression’ is available here on Amazon.